This article is about the British tennis player. For the clothing brand of the same name, see § Clothing label. For other people named Fred Perry, see Fred Perry (disambiguation). 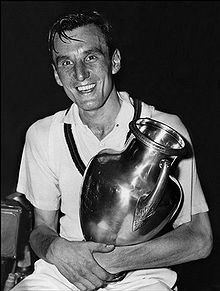 Frederick John "Fred" Perry (18 May 1909 – 2 February 1995) was a British tennis and table tennis player from England and former World No. 1 who won 10 Majors including eight Grand Slams and two Pro Slams single titles, as well as six Major doubles titles. Perry won three consecutive Wimbledon Championships from 1934 to 1936 and was World Amateur number one tennis player during those three years. Prior to Andy Murray in 2013, Perry was the last British player to win the men's Wimbledon championship, in 1936, and the last British player to win a men's singles Grand Slam title, until Andy Murray won the 2012 US Open. Perry was the first player to win a "Career Grand Slam", winning all four singles titles, which he completed at the age of 26 at the 1935 French Open. He remains the only British player ever to achieve this. Perry's first love was table tennis and he was World Champion in 1929. He began playing tennis aged 14 and his tennis career at 21, when in 1930 an LTA committee chose him to join a four-man team to tour the United States. In 1933, Perry helped lead the Great Britain team to victory over France in the Davis Cup; the team's first success since 1912, followed by wins over the United States in 1934, 1935, and a fourth consecutive title with victory over Australia in 1936. But due to his disillusionment with the class-conscious nature of the Lawn Tennis Club of Great Britain, the working-class Perry turned professional at the end of the 1936 season and moved to the United States where he became a naturalised US citizen in 1938. In 1942, he was drafted into the US Army Air Force during the Second World War. Despite his unprecedented contribution to British tennis, Perry was not accorded full recognition by tennis authorities until later in life because between 1927 and 1967, the International Lawn Tennis Federation, ignored amateur champions who later turned professional. In 1984, a statue of Perry was unveiled at Wimbledon, and in the same year he became the only tennis player listed in a survey of 2,000 Britons to find the "Best of the Best" British sportsmen of the 20th century. Perry was born in Stockport, in 1909 where his father, Samuel Perry (1877–1954), was a cotton spinner. For the first decade of his life, he also lived in Bolton, Lancashire, and Wallasey, Cheshire, because his father was involved in local politics. When living in Wallasey he attended Liscard Primary School and Wallasey Grammar School. Perry moved to Brentham Garden Suburb in Ealing, west London aged eleven years when his father became the national secretary of the Co-operative Party after World War I. His father became the Labour and Co-operative Party Member of Parliament for Kettering in 1929. Perry first began to play tennis on the public courts near his family's housing estate. He was educated at Ealing Grammar School for Boys. In 1928–29 Perry won several medals in the single, double and team events in the World Table Tennis Championships. He had exceptional speed and played with the Shakehand style, attacking the ball low and on the rise. Along with the US, French and Australian Amateur championships, Perry won the Wimbledon men's title three times in succession between 1934 and 1936. His final triumph was a 6–1, 6–1, 6–0 victory over the German Baron Gottfried von Cramm which lasted less than 45 minutes. It became the quickest final in the 20th century and the second shortest of all time. Perry had been able to pick up the information from the Wimbledon masseur that von Cramm had been treated for a groin strain and was as a result having difficulty moving wide on the forehand. During his amateur playing career he trained with Arsenal football club to focus on his fitness. Perry's success attracted the adoration of the crowds at Wimbledon particularly as he contrasted sharply with the privileged background of most patrons and players associated with the All England Club at the time. The upper echelons of the British tennis establishment greeted his success more coolly, regarding him as an "upstart". After winning his maiden Wimbledon title, Perry recalled overhearing a Wimbledon committee member remark that "the best man didn't win." His All England Club member's tie, awarded to all winners of the Championships, was left for him on a chair in his dressing room. In the Davis Cup, Perry led the Great Britain team to four consecutive victories from 1933 to 1936, with wins over France in 1933, the United States in 1934 and 1935, and Australia in 1936. Perry competed in a total of 20 Davis Cup matches, winning 34 of his 38 rubbers in singles, and 11 out of 14 in doubles. After three years as the world No. 1 tennis amateur player, Perry turned professional in late 1936. This led to his being virtually ostracised by the British tennis establishment. He made his professional debut on 6 January 1937 at the Madison Square Garden against the best professional player, Ellsworth Vines. For the next two years he played lengthy tours against Vines. In 1937, they played 61 matches in the United States on their big tour, with Vines winning 32 and Perry 29. They then sailed to Britain, where they played a brief tour. Perry won six matches out of nine, so they finished the year tied at 35 victories each. The following year, 1938, the big tour was even longer, and this time Vines beat Perry 49 matches to 35, while a short tour of the Caribbean and Central and South America ended at four victories a piece. Don Budge won the Grand Slam in 1938 as an amateur and then turned professional and played a series of matches against both Vines and Perry in 1939, beating Vines 22 times to 17, and beating Perry by 28 victories to 8. Perry also won the US Pro title in 1938 and 1941, held in Chicago in both those years. Perry was one of the leading bachelors of the 1930s and his off-court romances were reported in the world press. Perry had a romantic relationship with the actress Marlene Dietrich and in 1934 he announced his engagement to the British actress Mary Lawson, but the relationship fell apart after Perry moved to the US. In 1935 he married an American film star Helen Vinson, but their marriage ended in divorce in 1940. In 1941 he was briefly married to a model, Sandra Breaux. Then, in 1945, he married Lorraine Walsh, but that marriage also ended quickly. Perry's final marriage to Barbara Riese in 1952 lasted over forty years, until his death. They had two children, Penny and David. David led his father's clothing line prior to a buy out. The sister of Barbara (Bobby) Riese was the actress Patricia Roc. In July 1937, an England vs America pro-celebrity tennis doubles match was organized, featuring Perry and Charlie Chaplin playing against Groucho Marx and Ellsworth Vines, to open the new clubhouse at the Beverly Hills Tennis Club. Perry had an older sister Edith, they were both born in Stockport, Cheshire. Edith greatly supported her younger brother throughout his sporting achievements. Perry had a half sister, Sylvia. Perry died at Epworth Hospital in Melbourne, Australia after breaking his ribs following a fall in a hotel bathroom. Perry is considered by some to have been one of the greatest players ever to have played the game. In his 1979 autobiography Jack Kramer, the long-time tennis promoter and great player himself, called Perry one of the six greatest players of all time. Kings of the Court, a video-tape documentary made in 1997 in conjunction with the International Tennis Hall of Fame, named Perry one of the ten greatest players of all time. But this documentary only considered those players who played before the Open era of tennis that began in 1968, with the exception of Rod Laver, who spanned both eras, so that all of the more recent great players are missing. Kramer, however, had several caveats about Perry. He says that Bill Tilden once called Perry "the world's worst good player". Kramer says that Perry was "extremely fast; he had a hard body with sharp reflexes, and he could hit a forehand with a snap, slamming it on the rise—and even on the fastest grass. That shot was nearly as good as Segura's two-handed forehand." His only real weakness, says Kramer, "was his backhand. Perry hit underslice off that wing about 90 % of the time, and eventually at the very top levels—against Vines and Budge—that was what did him in. Whenever an opponent would make an especially good shot, Perry would cry out 'Very clevah.' I never played Fred competitively, but I heard enough from other guys that 'Very clevah' drove a lot of opponents crazy." Perry, however, recalled his days on the professional tour differently. He maintained that "there was never any easing up in his tour matches with Ellsworth Vines and Bill Tilden since there was the title of World Pro Champion at stake." He said "I must have played Vines in something like 350 matches, yet there was never any fixing as most people thought. There were always people willing to believe that our pro matches weren't strictly on the level, that they were just exhibitions. But as far as we were concerned, we always gave everything we had." Another comment from Kramer is that Perry unwittingly "screwed up men's tennis in England, although this wasn't his fault. The way he could hit a forehand—snap it off like a ping-pong shot—Perry was a physical freak. Nobody else could be taught to hit a shot that way. But the kids over there copied Perry's style, and it ruined them. Even after Perry faded out of the picture, the coaches there must have kept using him as a model." In the late 1940s, Perry was approached by Tibby Wegner, an Austrian footballer who had invented an anti-perspirant device worn around the wrist. Perry made a few changes to create the first sweatband. Wegner's next idea was to produce a sports shirt, which was to be made from white knitted cotton pique with short sleeves and a buttoned placket like René Lacoste's shirts. Launched at Wimbledon in 1952, the Fred Perry tennis shirt was an immediate success. The white tennis shirt was supplemented in the late 1950s with coloured versions for table tennis in which white shirts are not allowed. These became popular in the 1960s as a symbol of mod culture. The brand's logo is a laurel wreath. It was based on the original symbol for Wimbledon. The logo, which appears on the left breast of a garment, is stitched into the fabric of the shirt. The brand was initially run by the Perry family, namely his son David, until it was bought by Japanese company Hit Union in 1995. However, the Perry family continued to work closely with the brand keeping Fred's legacy alive. The brand has been the clothing sponsor of British tennis player Andy Murray at the start of his career until 2009. Fred Perry Way sign in the Metropolitan Borough of Stockport. A bronze statue of Fred Perry was erected at the All England Lawn Tennis Club in Wimbledon, London in 1984 to mark the 50th anniversary of his first singles championship. It is located at the Church Road gate. Perry's home town of Stockport has numerous memorials to the former tennis champion. For instance there is a blue plaque commemorating the house where he was born. In September 2002, a designated walking route called the Fred Perry Way was opened through the Metropolitan Borough of Stockport. The 14 miles (23 km) route from Woodford in the south to Reddish in the north, combines rural footpaths, quiet lanes and river valleys with urban landscapes and parklands. Features along the route include Houldsworth Mill and Square, the start of the River Mersey at the confluence of the River Tame and River Goyt, Stockport Town Centre, Vernon and Woodbank Parks and the Happy Valley. The route also passes through Woodbank Park where Perry played some exhibition tennis matches. In November 2010, Prince Edward, Earl of Wessex and John Perry, Fred Perry's grandson, opened Fred Perry House in Stockport. The building, which is the borough's new civic headquarters, will be used by various local government agencies. In June 2012 an English Heritage blue plaque was unveiled on the house at 223 Pitshanger Lane, Ealing, London where Perry lived between 1919 and 1935. Perry was inducted into the International Tennis Hall of Fame in Newport, Rhode Island in 1975. Perry received a Doctor of Laws degree, honoris causa, from Washington and Lee University on 4 June 1987. He had coached the W&L tennis team in 1941 and again in 1947. In the United States, two drives in El Paso, Texas and Baton Rouge, Louisiana, and a street in Springfield, Tennessee, are named after Fred Perry. 1928 Stockholm: Silver Doubles; Bronze Mixed Doubles; Bronze Team. 1929 Budapest: Gold Singles; Bronze Doubles; Bronze Team. Fred Perry joined professional tennis in 1937 and was unable to compete in the Grand Slams tournaments. ^ a b Peter Jackson (3 July 2009). "Who was Fred Perry?". BBC. Retrieved 24 March 2019. ^ a b "Fred Perry: Career match record". thetennisbase.com. Tennis Base. Retrieved 3 November 2017. ^ "Myers Seeds Fred Perry No. One; But Three Yanks Place", The Lewiston Daily Sun, 13 September 1934. ^ a b "Fred Perry, Wimbledon's true champion, dies at 85". The Independent. 3 February 1995. Retrieved 19 May 2017. ^ "Who was Fred Perry?". BBC. 3 July 2009. Retrieved 5 June 2011. ^ a b c d e f Peter Jackson (3 July 2009). "Who was Fred Perry?". BBC News. Retrieved 6 July 2012. ^ "ITTF_Database". Ittf.com. Archived from the original on 16 October 2012. Retrieved 9 July 2012. ^ ""Event Guide - History, Fred Perry" at .wimbledon.org". Aeltc2010.wimbledon.org. Retrieved 9 July 2012. ^ "Why tennis establishment shunned Fred Perry, Britain's previous Wimbledon men's winner in 1936". The Independent. 7 July 2013. Retrieved 10 July 2013. ^ Magill, Frank N., ed. (1999). Dictionary of World Biography (1. ed.). Chicago: Fitzroy Dearborn. pp. 2979–2982. ISBN 978-1579580483. ^ "BUDGE WINS, 6–2, 6–2, 6–3; Don Beats Vines in Montreal and Will Arrive Here Today". The New York Times. 7 March 1939. Retrieved 18 March 2012. ^ "BUDGE TRIUMPHS, 8–6, 6–2; Don Beats Perry for 28th Time at White Plains". The New York Times. 9 May 1939. Retrieved 18 March 2012. ^ The Bud Collins History of Tennis: An Authoritative Encyclopedia and Record Book. New Chapter Press. 2008. p. 66. ISBN 978-0-942257-41-0. ^ "The Marx brothers on film: souped-up comedy". Financial Times. Retrieved 21 March 2019. ^ Doward, Jamie (10 May 2009). "How Britain's prince of tennis wooed Hollywood's top stars". London: The Observer. Retrieved 3 June 2009. ^ Writing in 1979, Kramer considered the best ever to have been either Don Budge (for consistent play) or Ellsworth Vines (at the height of his game). The next four best were, chronologically, Bill Tilden, Fred Perry, Bobby Riggs and Pancho Gonzales. After these six came the "second echelon" of Rod Laver, Lew Hoad, Ken Rosewall, Gottfried von Cramm, Ted Schroeder, Jack Crawford, Pancho Segura, Frank Sedgman, Tony Trabert, John Newcombe, Arthur Ashe, Stan Smith, Björn Borg and Jimmy Connors. He felt unable to rank Henri Cochet and René Lacoste accurately but felt they were among the very best. ^ The History of Professional Tennis, Joe McCauley. ^ Fred Perry Logo: Design and History. FamousLogos.net. Retrieved 21 May 2011. ^ "Official Opening of Fred Perry House". Stockport Council. Retrieved 9 June 2011. ^ "Washington and Lee honorary degrees" (PDF). Archived from the original (PDF) on 19 May 2014. Retrieved 8 June 2013. McCauley, Joe (2003). The History of Professional Tennis. 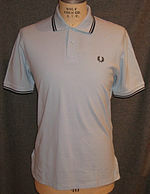 Wikimedia Commons has media related to Fred Perry. This page was last edited on 12 April 2019, at 19:29 (UTC).